"How can you be down when you're up in the trees?" 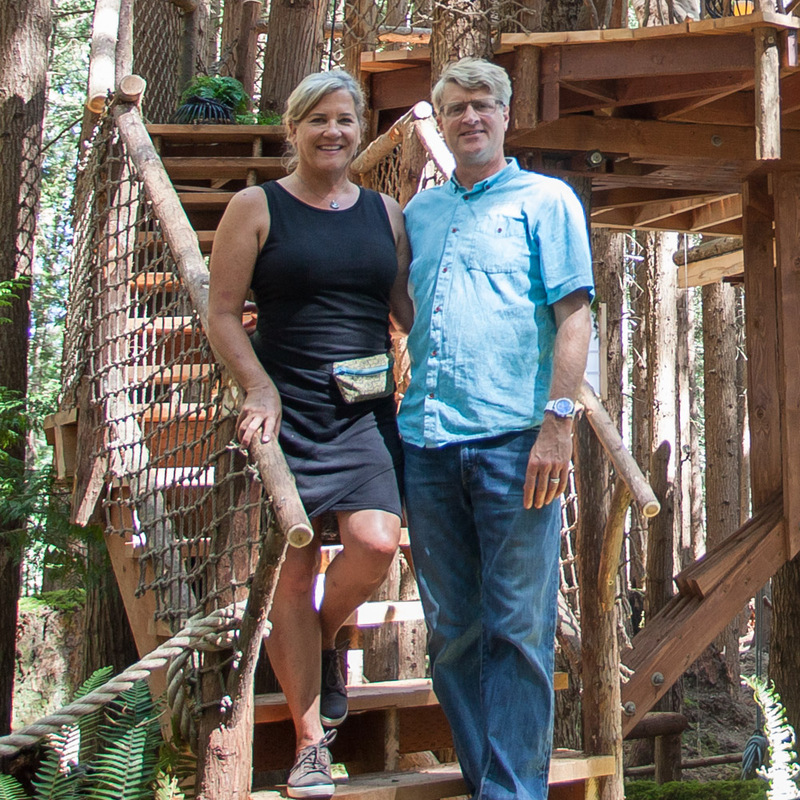 Gwen and Alan, owners of Story Book Farm in North Carolina, invited Pete to their idyllic property to build an English cottage-themed treehouse retreat. With goats, horses, donkeys, and chickens to care for, Gwen and Alan rarely have time to head out of town for a vacation. The couple dreamed of building a treehouse on their farm as a space to get away without truly getting away- the treehouse would provide space for rest and rejuvenation at home. As Gwen put it, "how can you be down when you're up in the trees?" Pete was so excited to build his first treehouse in North Carolina, and loved working on Gwen and Alan's enchanting farm. He especially enjoyed meeting little Pete, a baby goat who loves treehouses as much as he does! Nestled 11 feet high in a grove of sweet gums, oaks, and poplar trees, the finished treehouse offers stunning views of Gwen and Alan's picturesque farmland. Classic touches like gabled dormers and hand-carved dovecotes bring the charm of the English countryside to this sweet southern treehouse. Gwen and Alan can curl up with a good book in the cozy lounge or snooze in their dreamy hanging bed while their daughter, Anna, plays up in the loft. PETE WITH "LITTLE PETE" THE GOAT. READ TO THE END OF THIS POST FOR AN UPDATE ON THIS ADORABLE GOAT! The treehouse's 38-foot width is supported by seven TABs and a combination of static and dynamic uplift arrestors. Can you spot the dovecote hidden in the eaves of the roof? The crew carved it from a hollowed-out cedar log. This lovely outhouse contains a composting Hank Stank Tank. The 420-square-foot main floor holds a kitchenette, lounge, dining area, built-in daybed reading nook, and master bedroom replete with a Custom Carolina Hanging Bed. The crew installed white-washed Douglas fir paneling to create a classic cottage vibe. The crew added a set of French doors and a Dutch door to let in lots of natural light. The Dutch door fits perfectly with the farmland setting, as the two-part design was originally invented to allow fresh air into the house while keeping farm critters out. No goats will be able to accidentally sneak into this treehouse! The built-in daybed beneath the windows to the left provides added storage and seating. This Custom Carolina Hanging Bed adds whimsy to the bedroom. It's perfect for a treehouse, since it can sway gently with the movement of the trees! Natural light streams into the treehouse through large windows. With a lounge as cozy as this, Gwen and Alan might want to move into their treehouse full time! A ladder leads to this secret loft, where Anna can play and dream. Gwen and Alan are able to soak in spectacular views of their farm from the treehouse deck. This way, they can keep an eye on the animals while gaining some much-needed distance and perspective. It's the ideal place for a "staycation!" The crew installed hog wire panels to create an airy yet secure railing. Find out how to make your own hog wire railing in our DIY video! A couple heavy-duty posts help out the trees in providing support for this expansive treehouse. The crew loved building for Gwen and Alan on their beautiful Story Book Farm! It was a treat to meet little Pete (the baby goat) and create a retreat for this hardworking couple. We wish Gwen, Alan, and Anna a lifetime of laughter, rest, and happiness in the trees! One year after completing Gwen and Alan's treehouse, Pete returned to Story Book Farm for a visit. He was reunited with little Pete, and realized the adorable goat had grown considerably in the interim. Little Pete isn't so little anymore, but still just as sweet! Little Pete is all grown up! To stay up-to-date with all our treehouse tours and more, subscribe to our mailing list and follow us on social media.